Skin cancer is on the rise and young women are one of the hardest hit groups, says Joel Schlessinger MD. The risks of tanning beds and sun bathing have been well documented and confirmed by studies within the last few years. While many are choosing to avoid this dangerous habit, the results of years of tanning are becoming more and more apparent, especially in young women. This article shared by Joel Schlessinger reveals that melanoma has increased eightfold in women under 40. Frequent use of tanning beds is a major contributor to this trend, says Joel Schlessinger MD. This article features a study performed by Mayo Clinic that reveals which age groups have seen the largest increase in skin cancer cases. Researchers speculate that young women are seeing an increase because they are the most likely to use tanning beds. It is estimated that 70 percent of the 20 million people who use tanning beds each year are women under the age of 40. Because the lamps in tanning beds give off 10 to 15 times more radiation that the sun, women who tan are seeing cases of melanoma earlier in their lives. Even women who do not use tanning beds can be more at risk if they are exposed to the sun for long periods of time. Women should take precautions to reduce their risks, advises Joel Schlessinger MD. Along with avoiding tanning beds, women should limit the amount of time they spend in the sun. If you are exposed to the sun, always wear a broad spectrum sunscreen and reapply every two hours. You should also visit a dermatologist at least once a year to check for signs of melanoma and skin cancer. Let Joel Schlessinger MD know of any questions or comments you may have by commenting on this blog. The ingredients are what differentiate chemical and physical sunscreens, explains Joel Schlessinger MD. As with any skin care product, it’s important to know exactly what you’re buying when you purchase a sunscreen. Sun protection factors, broad spectrum designations and chemical and physical distinctions can seem like gibberish if you don’t understand the difference. In this presentation, Joel Schlessinger MD helps you eliminate some of the guesswork by explaining the difference between chemical and physical sun protection products. Physical and chemical sunscreens contain certain ingredients that protect the skin differently. Physical sunscreens contain ingredients such as zinc oxide and titanium dioxide while chemical sunscreens contain ingredients like avobenzone, octinoxate, oxybenzone and homosalate. Which is better: chemical or physical? Joel Schlessinger MD explains. Both physical and chemical sunscreens provide excellent protection against UV rays. While physical sunscreens deflect sunlight, chemical sunscreens neutralize the intensity of the rays. Whether it’s physical or chemical, sunscreen must be reapplied every couple of hours and it is important to choose a water-resistant formula. Choosing between physical and chemical sunscreen is a matter of preference. Chemical sunscreens are usually colorless while physical sunscreens tend to leave a white residue. Because some of the ingredients may interact with skin, those with sensitive skin should stick with a physical sunscreen. Joel Schlessinger MD highlights his choices for both chemical and physical sunscreens. Chemical sunscreens such as LovelySkin Replenishing Sunblock SPF 36 and NIA24 Sun Damage Prevention UVA/UVB Sunscreen SPF 30 PA+++ both offer broad spectrum protection to defend against UVA and UVB rays. These products neutralize UV rays to prevent skin cancer and signs of aging. For a physical sunscreen, try SkinCeuticals Physical Fusion UV Defense SPF 50 or Jan Marini Physical Protectant SPF 45. Each of these products forms a barrier against UVA and UVB rays. Check out more presentations from Joel Schlessinger MD on SlideShare. How do you protect yourself in a harsh desert climate? Joel Schlessinger MD shares. In the United States, summer climates range from mild to blazing. In areas such as the Southwest, temperatures and direct sun exposure lead to an increase in the number of skin cancer cases. 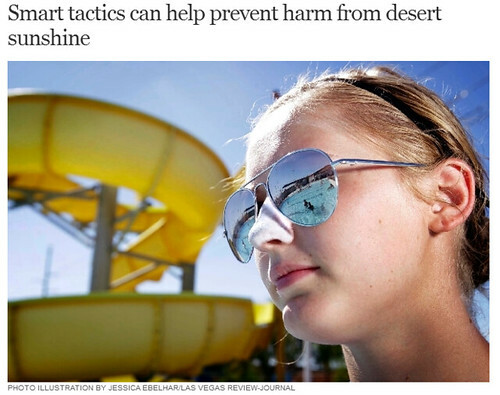 An article from the Las Vegas Review Journal highlights the dangers facing those who live in warm climates as well as how to combat this risk. Along with tips for finding the best sunscreen and how to properly apply it, this article highlights other tricks for protecting yourself this summer. Certain individuals may be at more a risk than others, explains Joel Schlessinger MD. While everyone should be worried about sun protection, research suggests that older individuals as well as young children may be the most at risk groups. Young children tend to have delicate skin that can be more prone to damage. This group is also likely to spend the most amount of time outdoors, especially in places with warm climates. As we age, our skin becomes thinner, making us more susceptible to UV damage. To reduce the risks of overexposure, dermatologists recommend daily sunscreen use along with lightweight clothing and hats. People should also seek shade during the peak hours of the day when UV rays are the strongest. According to dermatologists such as Joel Schlessinger MD, many people forget to protect their eyes. The eyes are an area that many people do not think about when applying sun protection products. Both the area surrounding the eyes and the eye itself are susceptible to damage. UV rays can contribute to cataracts, growths and other health issues including skin cancer. One of the easiest ways to protect the eyes is by wearing sunglasses. Many styles filter UV rays to prevent damage. Questions or comments for Joel Schlessinger MD about sun protection? Let him know in the comment section. On average, people don’t put on enough sunscreen. Joel Schlessinger MD explains. Even with new label requirements setting a higher standard for manufacturers, the majority continue to make the same mistakes when applying sunscreen. A recent article in MedPage Today titled “Sunscreen: New Labels, Same Problems” details how the labeling mandates have helped, but the two most common problems remain: not putting on enough sunscreen and not reapplying frequently enough. Joel Schlessinger MD warns his patients of the importance of proper sunscreen application and reapplication. Joel Schlessinger MD discusses the proper amount of sunscreen required for optimal protection. You need a generous amount of sunscreen to completely cover and protect your skin. Joel Schlessinger MD recommends his patients apply a full ounce, or the equivalent of a full shot glass, to protect the whole body. Sunscreen needs to be applied at least 30 minutes before sun exposure. Joel Schlessinger MD says it is also important to reapply at least every two hours, and even more often if swimming or sweating. Sunscreen is an important part of your daily routine, says Joel Schlessinger MD. When you’re spending time in the sun, don’t forget to protect your ears, the part in your hair and any bald spots on your head. These places are easily burned and often forgotten when applying sunscreen. Sun protection is also important even when you’re not in direct sunlight. Car windows block UVB rays, but not UVA rays, which can cause premature aging and significant sun damage. Joel Schlessinger MD recommends sun protection clothing for another layer of UV defense. Look for clothing with an ultraviolet protection factor (UPF), a rating that measures UV protection provided by fabric. Wearing a hat can also protect your scalp, face and neck from direct sun exposure. Do you have a sunscreen question for Joel Schlessinger MD? Share with us in the comments. Joel Schlessinger MD advises using facial peels to regain youth and vitality for your skin. Not everyone has the time or energy to go to the spa for a weekly facial peel. For those times when you need a boost of skin rejuvenation, Joel Schlessinger MD recommends at-home facial peels to replace professional treatments. These concentrated formulas renew the complexion and offer a wide range of benefits for all skin types. View this presentation to learn about the different kinds of facial peels and which one is right for you. Why should I be using a facial peel? Joel Schlessinger MD explains. Whether you have dry, oily, acne-prone or sensitive skin, a peel can benefit your complexion. Facial peels contain a number of advanced ingredients that deeply renew the complexion by removing dead skin cells. Removing this dulling debris helps minimize the appearance of aging such as fine lines, wrinkles, discoloration and other signs of damage. There are many types of peels that you can use daily or weekly to brighten and renew the complexion. These peels create a soft and smooth texture as well as a more even tone. Joel Schlessinger MD offers a number of suggestions for at-home facial peels. For a gentle face peel, try an exfoliating product such as LovelySkin Exfoliating Gel Mild. This product smooths a rough texture while minimizing the appearance of enlarged pores and other imperfections. Another gentle product is Phytomer Peeling Vegetal Exfoliant, which exfoliates without the use of harsh ingredients. Other products such as Dr. Dennis Gross Skincare™ Alpha Beta Daily Face Peel and NeoStrata Skin Active Perfecting Peel offer two steps for increased skin rejuvenation. The first step exfoliates to remove dead skin cells and encourages cellular turnover to fade signs of aging. The second step neutralizes and soothes the skin to prevent redness, dryness and irritation. Check out more presentations by Joel Schlessinger MD on SlideShare. Joel Schlessinger MD shares an article that highlights the effect of summer on certain skin conditions. Once summer comes around, most people are eager to take advantage of activities such as camping, lounging by the pool and spending days at the beach. These pastimes may not be the best for people who suffer from conditions such as psoriasis and eczema, however. An article from MedPage Today explains why summer time can be a particularly difficult time for patients with these conditions. Flare-ups of chronic skin conditions can be very common in the summer, explains Joel Schlessinger MD. Sunlight and heat affect the health of your skin and exposure to these elements can cause irritation. During the summer, many people are exposed to heat while at the pool or beach. If you frequently swim in pools, chlorine may also be affecting the health of your skin. This chemical can cause irritation, itching and dryness, especially for those who suffer from eczema or psoriasis. Limiting your time in the pool is one way to prevent irritation from occurring. You should also be extra diligent about applying sunscreen to avoid causing any extra damage to your skin. According to Joel Schlessinger MD, bug bites, rashes and other irritations can also affect the health of skin in summer. While most insect bites and rashes are not dangerous, they can be damaging to the skin if they start to itch. Scratching not only causes conditions such as eczema and psoriasis to worsen, it also causes painful symptoms and increases the risk of infection. If you experience an insect bite or an allergic reaction, it is important to keep the area clean to prevent infection. You can also take precautions such as wearing protective clothing and insect repellent to prevent this issue. Questions for Joel Schlessinger MD? Ask him in the comment section below! A toner should be part of your daily skin care routine, says Joel Schlessinger MD. Most people have their basic skin care routine figured out. They cleanse, treat, moisturize and protect their skin every day. Many people, however, skip using a toner and are missing out on some major benefits. According to most dermatologists, this step is important for maintaining healthy skin. In this presentation, Joel Schlessinger MD explains why you should be using a toner and makes recommendations for your skin type. Facial toners purify, balance and normalize the complexion, explains Joel Schlessinger MD. Using a toner daily helps remove makeup residue, oil, dirt and debris from deep within pores. Removing this buildup not only promotes a clearer and healthier complexion, it also improves the efficacy of your other skin care products. Toners also help restore the pH balance of the skin, which is important for maintaining a healthy complexion. After cleansing morning and night, use a cotton ball or pad to swipe a toner onto the skin. This will help purify pores and prepare your complexion for your treatment creams, serums and moisturizers. Certain toners can also be applied throughout the day to refresh and rejuvenate skin. How do I know which toner is right for me? Joel Schlessinger MD offers his suggestions. Products such as LovelySkin Toner Mist 3% Amino Fruit Acid and Obagi Nu-Derm Toner #2 are ideal for normal skin types because they balance the complexion. For more oily skin, try a natural astringent such as Dr. Hauschka Facial Toner. Dry or sensitive skin types can use a gentle toner such as Avene Thermal Spring Water multiple times throughout the day to calm and soothe their skin. Do you have more questions about which toner is right for you? Ask Joel Schlessinger MD in the comment section below!